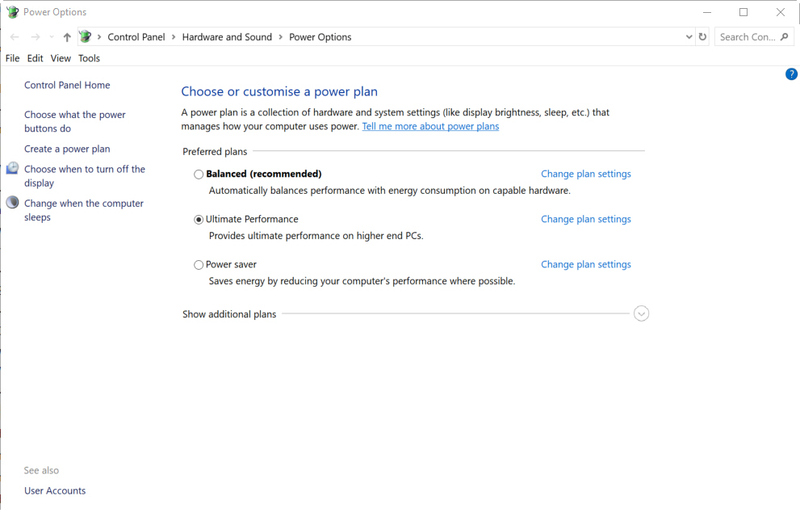 Windows 10 offers a number of power plans you can switch to, depending on your needs. 'Balanced' is the recommended choice, but if you have a high-end system and want to really get the most out of it, it’s worth activating the Ultimate Performance power plan. This plan is really designed for workstations, but gamers and video editors will benefit from it too. It likely won’t be available to simply switch to on your PC, but you can enable it with this simple hack. Firstly, we should state the Ultimate Performance power plan is designed for high-end desktop systems. While you can enable it on a decent laptop it’s not really advisable as it can eat through battery life like no one’s business. Open Settings >System > Power & sleep and click the Additional power settings link. Under Choose to customize a power plan, expand the option which says Additional power settings. With luck you should see Ultimate Performance listed, but if not, don’t worry, adding it is straightforward. Go back to the power options screen and repeat the steps. You should now see Ultimate Performance listed and can enable it. You can further customize the plan, depending on your requirements. If you want to disable the new plan, go back to Power Options list, and select a different choice.